Daniel Defoe noted in the 1720s that: "There's little that is remarkable in Rochester, except the ruins of a very old castle." Travelogue author Celia Fiennes described the castle as "a pretty little thing". 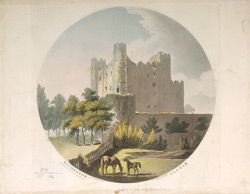 The castle is Rochester's principle landmark, dominating any view of the city.